If you type in #AMWCooks on Instagram, you'll notice I haven't done anything "baked". I guess it's because I have a brother who is an AWESOME baker I just leave the "Baker Crown" to him! For a first-timer, these came out not bad right? If we can do it, you definitely can! Mix until everything until you don't see any lumps. At this stage, I just leave the mixing to my son who was so eager to do this task and do the rest once he's tired! At this stage, you have to quit worrying about mess and enjoy the ride! It will be messy for sure but it was all worth it! Once you are happy with the consistency, scoop batter and fill it into a muffin pan until 3/4 full. The oven was preheated over 350F/177C. Bake for 20-25 minutes and remove from pan and allow to cool completely before frosting. Cream butter and shortening together with a mixer or wooden spoon. We have a mixture at home but we chose to do the manual labor because again, this is not just a baking activity but bonding time between me and my son. Gradually add the sugar followed by milk and vanilla. Beat until light and fluffy and add more sugar if needed depending on your desired sweetness. I let Kyle do his work as I enjoy watching how he is such a natural in the kitchen! Feel free to spread or pipe the vanilla buttercream on cooled cupcakes. Note to everyone: The Vanilla Buttercream isn't fluffy enough as I left my son to do that job! For me, I don't mind the not-so-pretty buttercream as long as we enjoyed the activity and nevertheless, they tasted really good! Fellow mommies with toddlers, don't be scared to let your daughter or son play with you in the kitchen! 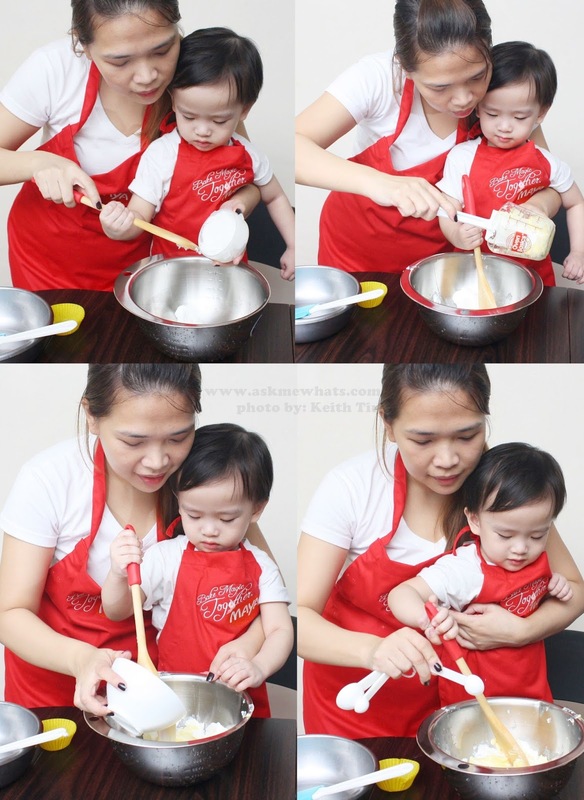 They don't need to have interest on cooking or baking but letting them in with your daily activities will make them feel closer to you, at the same time, they learn so much in terms of ingredients, colors, shapes and even textures! 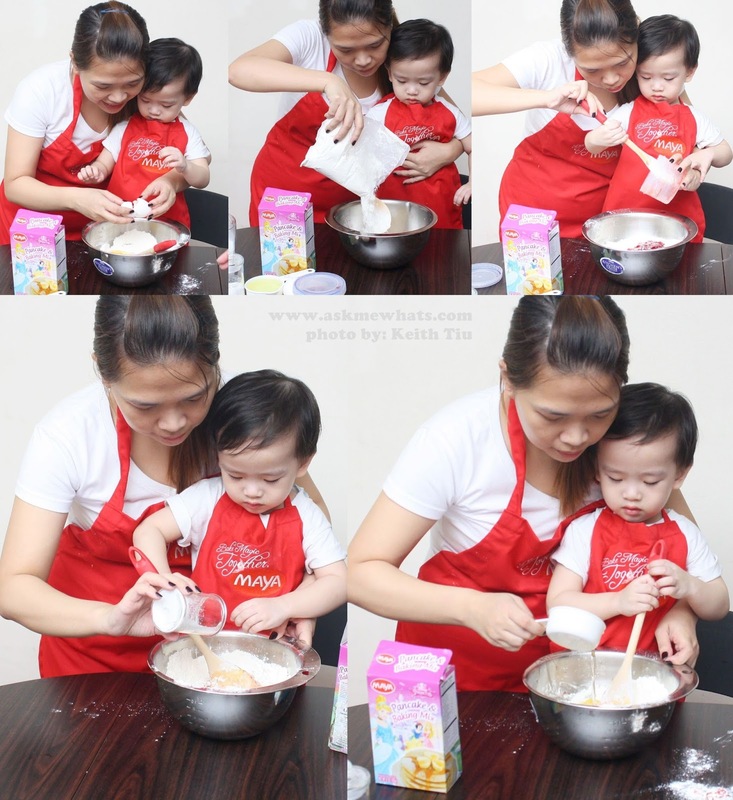 Kyle can now say: "Eggs" "Butter" "Flour" "Strawberry" because I highly believe in FUN-Learning! Kudos to Kyle for a great job and all thanks to my ever supportive husband Mr. AMW for cleaning up the mess we made and for taking our photos! This is entirely a family affair I will keep in my heart forever! Any other easy-to-do, kid-friendly recipes you may want to share? thanks sis! how are you? Happy HOlidays! Kyle looks adorable maybe when he's old enough he'll be the one to dethrone his uncle lol! Ang cuteee!!! Naman ni kyle mukang enjoy na enjoy sa pagmimix! Minsan try ko rin gumawa ng ganyan with my daughter!!! Super enjoy ayaw umalis! kaya kung ano ano itsura na ng vanilla cream! Go ahead, bonding time between you and your daughter!